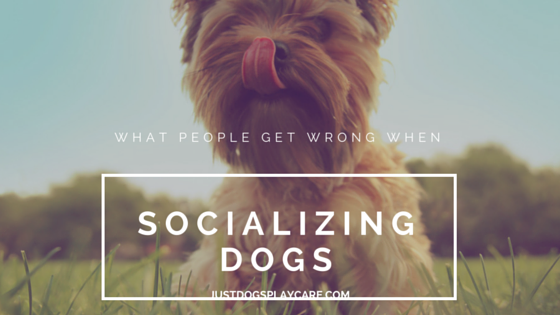 Socialization is something that is taught to domestic dogs, not innately learned. While puppies learn a tremendous amount about interacting and communicating with other dogs from their mother and litter-mates—particularly between the ages of 5 and 8 weeks of age—there is much they need to learn from humans, too. Once adopted, owners often put a lot of work into socializing their puppies by taking them new places, having them meet new people, and stretching their coping skills. When people adopt adult dogs, however, there is often less attention paid to socializing. This can be a big mistake. Socializing is important for any dog who enters a household. Here are some tips for better socializing an adult dog. While on a walk with your dog, and another dog approaches, avoid jerking or yelling at your dog. A dog learns from such interactions about what is right and what is wrong. By yelling or jerking, you create the impression that seeing or interacting with other dogs is a bad experience. Instead, distract the dog in a positive manner by using commands, treats, or toys. Just like humans, dogs should learn to be obedient to one another and to their owner. However, obedience lessons are not easy for all dogs. It’s really important to take your dog to obedience classes before anything else too challenging, such as going to a busy park with lots of people and dogs. As owner of this new dog, you need to learn how to communicate with him or her and get them to comply with what you want. A mistake too many people make is skipping obedience. Maybe your new dog does know a few commands, such as Sit and Shake, but that does not mean he or she will listen to you when you really need it. Obedience is really about more than teaching actions (such as Sit or Shake) or tricks. It is about enhancing communication. Through classes, you can learn how your dog relays information…and how you can relay information back. Try to learn your dog’s likes and dislikes, fears and joys. Understanding your dog better will teach you how to be a good coach. If your dog is tremendously fearful of new people, try not to baby him or her by letting them hide and saying “It’s OK.” If you sound worried, that just reinforces in the dog’s mind that he or she was right to be scared and worried. Instead, gently coax them out of hiding and give treats or a toy. Associate a good thing with the fearful thing, in small steps, and you will see progress. As I always say when working with dogs, progress, not perfection, should be your goal. You can’t totally change a dog’s personality, but you can help them learn to develop new coping skills. With a new dog, always start slow. On his or her first day with you, you should not take the dog to be around a large crowd of people. First do slow introductions to one person or a small group. What you are looking for, and teaching, is for the dog to react positively—without fear and without aggression—to new people. Some dogs are A-OK with this right away, and some need to take baby steps. Never force a dog by immersing him or her in something too soon. The main point to remember here is to remain positive. Reward each new challenge that is done right. Treats, praises, and rewards work well with dogs, and encourage them to do what is right. On the other hand, severe corrections and yelling creates nervousness that may translate to fear, aggression, or being shy. The Golden Rule applies here….do unto other dogs as you would have done to you. The more you work to understand your dog and go at his or her pace, the more your dog will work to please you!